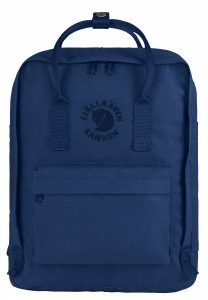 We’ve just announced Fjällräven as our first Marketing Partner, and to celebrate we’re giving supporters of Global Recycling Day a chance to win one of 70 eco-friendly, and super stylish, Re-Kånken backpacks made from recycled plastic – a perfect way to showcase the power of the Seventh Resource. As of 12 March 2018, our supporters on social media, from across the globe, will be invited to share their own Global Recycling Day celebration photos with us, whether it be of an event, recycling with the family, making a pledge, or something altogether different. We will then select 70 lucky recycling fans to receive a Fjällräven Re-Kånken backpack with a Global Recycling Day Frisbee (made of recycled plastic of course) and t-shirt (in super soft sustainable organic cotton) safely stored inside. To enter on Facebook, all you need to do is post your picture along with a message of support, and tag in @Global Recycling Day and @Fjällräven. Over on Twitter, we are asking followers to post their picture and use two hashtags #GlobalRecyclingDay and #Fjallraven. The competition will close on 19 March and the winners will be selected at random from entries that mention both Global Recycling Day and Fjällräven. The mission of Fjällräven is to inspire people to walk with nature with as little environmental footprint as possible. Founded in 1960, it has been working actively to care for both wildlife and nature. Among many sustainable projects, the company has chosen to focus on its namesake, the Scandinavian arctic fox, a species on the brink of extinction. The Re-Kånken backpack is dyed with Spin-Dye technology that radically reduces the amount of water, energy and chemicals used. With the same design as the original, the Re- Kånken has been reinvented from a recycling and recyclable perspective that saves natural resources. Entry is open to all excluding employees of Global Recycling Day, Fjällräven or anyone professionally connected with the administration of the draw. If you are under 16, please check with your parent or guardian before entering. The prize is a Global Recycling Day Frisbee (made from recycled plastic) and t-shirt (made from organic cotton) and a Fjällräven Re-Kånken backpack of a colour selected at random. The closing date for entries is no later than 19 March 2018. The winners will be announced by 23 March 2018 on Global Recycling Day’s social media feeds and will be notified within 28 days. On receipt of your address details please allow up to 28 days for receipt of your prize. Prize must be claimed by 30 March 2018. The judges’ decision is final and no correspondence will be entered into regarding the decision. Unless otherwise agreed in writing by the promoter, the prize will only be available to the winner and cannot be sold or passed on. Participants are required to supply complete and accurate details. In the case of incomplete or incorrect details being provided, or the Promoter being unable to contact the winner within 28 days, the promoter reserves the right to award the prize to a reserve selected at the same time as the original. By entering this competition you agree to your name and photo entry being used in any required publicity or marketing materials.